From start to finish, this handcrafted cutting board for bread is made in the Dickinson family’s woodworking shop in Indiana. Locally sourced and sustainably harvested wood—like ash, maple, cherry, and coffeenut—is used to make the striking striped design. 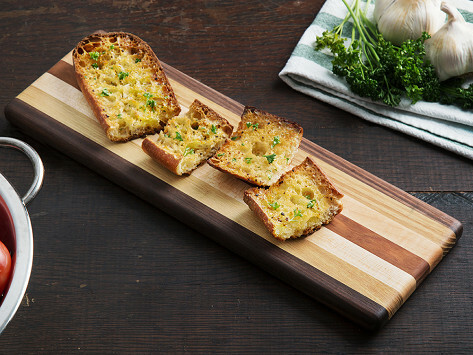 With proper care, like hand washing and seasoning it with oil, this beautiful bread board can last for many years. Dimensions: 5.25" x 15.5" x 0.75"
Kiyomi and Aaron Dickinson began making handcrafted cutting boards in the 1990’s in their garage in Indiana. They have since graduated to a proper woodworking studio where they are still at work making bread and cutting boards from start to finish. The bread board and double-sided cutting boards (with a handy grooved surface to corral juices) all start with locally sourced and sustainably harvested hardwoods, like maple, white oak, coffeenut, ash, and cherry. The color and grain of each one is showcased in the Dickinson’s distinctive striped design, and results in an attractive piece that easily moves between the kitchen and table. With the right care—like hand washing and seasoning it with oil—these boards can last for years.